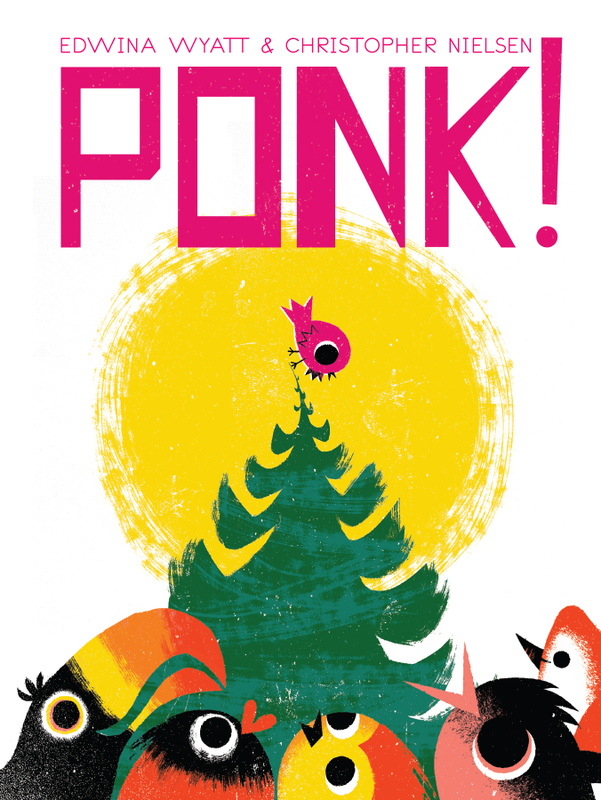 Ponk is a little bird who lives at the top of a very tall tree. From on high, Ponk can see The Hill and the strange beasts dancing and swaying way over there. But Ponk’s problem is not distance—it’s height. Ponk! is a strong, simple story about overcoming adversity, laced with gentle humour, for audiences aged three to six. Ponk lives, metaphorically speaking, out on a limb. Dwelling alone at the very top of the tree is risky for a little bird who can’t yet fly, and Ponk routinely topples and tumbles through the branches below. Those birds living beneath are not so impressed, and don’t mind mocking the plucky Ponk. They don’t see why Ponk keeps climbing up high—until curiosity gets the better of them. The story’s little drama is nicely rounded with a dash of comedy. Illustrator Christopher Nielsen’s digitally designed retro palette revels in dynamic contrasts, energising the text and letting the story fly. Nielsen’s old-school colour mix (think early Little Golden Books) is right at home with Edwina Wyatt’s reassuring tale. Wyatt makes good use of sound, rhythm and comic timing to engage young eyes and ears. Ponk! is a satisfying picture book about persistence, doing things your way, and not always following the flock.